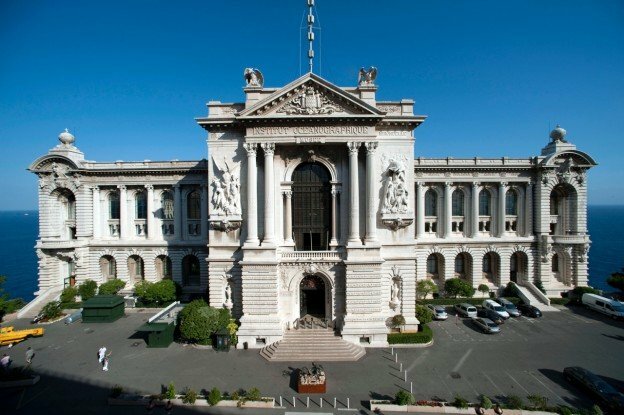 The Oceanographic Museum of Monaco is planning to stage a major Oceanic Art Exhibition focusing primarily on Australian Indigenous art on the thematic of Oceans and Water, from April to September 2016. The exhibition will officially be opened by H.S.H. Prince Albert II of Monaco on Tuesday March 22nd 2016. Everyone knows the Casino in Monaco, famous worldwide through the James Bond movies, but the striking Oceanographic Museum on the famous cliff close to the Prince Palace and overlooking the Mediterranean Sea is a major cultural attraction of the French Riviera with over 500,000 visitors during the height of the European Summer. 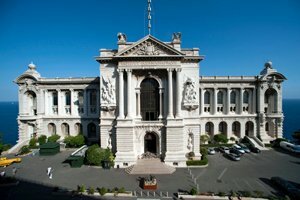 The Oceanographic Museum, as part of the Oceanographic Institute, Foundation Albert I, Prince of Monaco, is committed to enhancing the knowledge of the richness and fragility of the oceans, and promoting their sustainable management as well as their rational and efficient protection. It upholds and shares its mission, following the wish of its founder, Prince Albert I of Monaco (1848-1922): ‘knowing, loving and protecting the oceans’. The Oceanographic Museum plays a key role in the diffusion of Contemporary Art. Every year since 2010, major contemporary artists have been invited to present works responding to a same theme: the protection of oceans and marine biodiversity. Thus the artists Damien Hirst, Mark Dion, Marc Quinn and Huang Yong Ping have already exhibited within its walls. This six months exhibition will contribute to this dynamic and will be the major summer 2016 event at the Oceanographic Museum. The background of the full project refers to the deep and early interest that H.S.H. Prince Albert I of Monaco had towards indigenous people he met, and primitive arts that he collected. The Prince has gathered at the Oceanographic Museum all familiar and precious objects which he considered to be related to ocean life and that he was eager to acquire during his many travels. Furthermore, Indigenous People of Australia and from the Pacific region are dealing in their daily lives with the effects of global warming and pollution, in particular by macro-waste such as discarded fishing nets. For this exhibition, we wish to give voice to Australian Aboriginal and Torres Strait Islander artists through the works they will create relating to these phenomena affecting the oceans. Our concern was to search for artworks linked with the sea and which are consistent with the protection of the oceans policy conducted by the Oceanographic Institute. It is an ambitious project to be realised within a very short time frame but certainly a unique occasion for Australia, and for Queensland in particular, to present with us a project of excellence. The Oceanographic Institute of Monaco is a private foundation which dedicates all of its funds to research on marine life. They therefore request that all art projects presented at the Museum be fully self-funded. For this outstanding exhibition to happen in its entirety, it will require for each partner (including artists, art centres, and representatives) to secure funds from public and private sector sources. The project is managed by Stéphane Jacob from ARTS D’AUSTRALIE in Paris and coordinated in Australia by Suzanne O’Connell from SUZANNE O’CONNELL GALLERY and Tea Dietterich (board member of ABIE France and our CEO at 2M Language Services) is proud to be involved and supporting this unique exhibition. For further information and sponsorship opportunities please contact Tea C Dietterich, Stéphane Jacob or Suzanne O’Connell. The first exhibition will focus on cultural relationships relating to the sea of the Pacific peoples through a presentation of traditional and contemporary photographs and artefacts that will echo the collections gathered by Prince Albert I during his numerous scientific expeditions. The proposal has been made by Mr Didier Zanette, Director of the Lapita Gallery (Nice, Paris, Noumea) specialized in Pacific and Indonesian Arts, associated with Dominique Barbe, Senior Lecturer in History of Ancient Worlds at the University of New Caledonia. In the “Oceanomania” lounge (first floor), various Oceanic artefacts will be presented: paddles (carved or painted with tropical colors), prows of canoes and zoomorphic vessels as well as two canoes that will be displayed in the adjacent space of the first floor landing. In the prestigious Conference room (ground floor), a wonderful collection of photographs of Papuans Portraits painted for ceremonial and dance purposes will be shown. The second exhibition, in the Albert I exhibition hall (first floor), will present a selection of contemporary paintings created by Aboriginal artists from the desert on the theme of water and will include works from the private collection of H.S.H. Prince Albert II. Videos and photos made by young Indigenous artists will also illustrate the issue of the preservation of the environment and open a window towards new contemporary art practices. This proposal has been suggested by private collectors Mr Francis Missana and Marc Sordello (Antibes, France) associated with Sir Ian McLean, Professor at the University of Wollongong (Australia) and Ms. Erica Izett at the University of Western Australia (Australia). This project titled ‘Australia: Defending the Oceans at the Heart of Aboriginal and Torres Strait Island Art’ is curated by Mr Stéphane Jacob, Director of the Gallery Arts d’Australie, together with Ms. Suzanne O’Connell, Director of Suzanne O’Connell Gallery (Brisbane) Australian Coordinator. It is by far the most complete and ambitious project ever undertaken by Queensland Artists in Europe. The project has the Museum’s full support and, by its magnitude, requires as much help as possible to make it happen. It will showcase over seventy different artists working on six monumental installations to be displayed in six key positions in and around the museum. In the forecourt : Installation of 10 monumental ‘Bagu’ sculptures made out of recycled materials found on the beach in the vicinity of the Girringun community Cardwell, Queensland). Originally the “Bagu” was a sacred wooden tool used to keep the fire in each group. On the facade : ‘Githalai’, 3 large mud crabs created by Brian Robinson will climb on the facade of the Museum and will be an invitation for the public to discover the whole exhibition. Brian Robinson was born in the Torres Strait Islands, located between the tip of the Cape York Peninsula and Papua New Guinea. Hall of Honour (ground floor): Ghost nets Installation. Entitled ‘Ghost Net’ or ‘Aboriginal Art to the rescue of marine fauna in Australia’, the installation of over twenty works will be created by three Art Centres that will work together: Erub Arts (Darnley Island, Torres Strait, Queensland), Pormpuraaw Art & Culture Centre (Pormpuraaw, Cap York, Queensland), Ceduna Arts and Cultural Centre (SA – represented by Ghost Net Art Project, Turmoulin, Queensland.). Their installation will portray different sea animals trapped in abandoned fishing nets: turtles, sharks, dugongs, crocodiles, saw fish, octopus. Today, many marine and coastal species are threatened by discarded nets. The threat to marine biodiversity also endangers the survival of the peoples of the sea. First Floor Landing: Dari Ceremonial Headdresses. These works will be presented on the walls of the first floor landing of the Museum. Ken Thaiday is known for his works that use symbols of his native island, Erub (Darnley Island). His 3 to 6 meters high sculptures will represent Dari ceremonial headdresses which are created for dances and evoke traditional fish traps. The Dari is also found on the Torres Strait flag. The art of this region is little known and yet extremely rich. It reveals the intimate relationship linking the Torres Strait Islanders to their maritime environment. Terrace located on the rooftop of the Museum : «Sowlal» (Turtle Mating and Nesting Season ) – Monumental Stencil Floor Installation. In 2016 the main thematic of the Oceanographic Museum of Monaco will focus on sea turtles. The works by Alick Tipoti will register themselves very naturally within this thematic. Alick Tipoti is a Torres Strait Artist who has earned international acclaim. His work can be found in many public collections around the world. He recently performed at the British Museum in London. His two works proposed for the exhibition will address the theme of turtles courtship, mating and nesting. The bronze and aluminium sculpture placed at the entrance of the museum will greet all visitors. It will consist of two turtle bronze sculptures portraying the long process of mating for this endangered species that has been the most touched by discarded nets. The exceptional 670 m2 installation on the eastern terrace located on the roof of the Museum will allow visitors to discover the numerous animals and plant species found around the Torres Strait Islands. The main drawing will form the body of a monumental turtle that will be visible from the air. This very emblematic work will certainly be one of the most popular icons of this full project. This spectacular proposal requires a full budget of 1 300 000 € (circa $AUD 1 900 000) to cover creation, transport (incl. return), installation & dismantling, travel costs (up to 30 individuals); insurance, administrative costs, coordination, project management, catalogues, brochures for visitors, two dance groups, Media & PR France & Australia, social networks, films & photographs, advertising (posters & ads), legal fees, public programs, fundraising, miscellaneous/unexpected… If you are interested in becoming a sponsor, please contact us. ⟵Who’s joining us at GALA2016 in NYC next March?